● DeWine sponsored background checks with Chuck Schumer and Joe Lieberman. ● DeWine joined Schumer and Dianne Feinstein to bring back the Clinton gun ban. 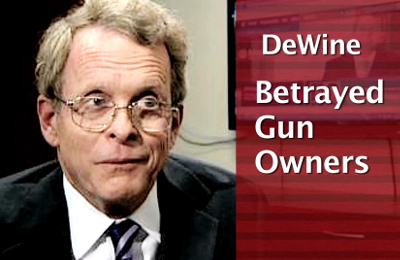 ● DeWine voted to bankrupt gun manufacturers through liability lawsuits. And now anti-gun Mike DeWine is digging in his heels, REFUSING to go on record about your gun rights in advance of the May 8th Republican Primary! This is a slap across the face of gun owners. That’s why we have prepared this radio/video ad exposing DeWine’s record of attack against our gun rights. If Mike DeWine won’t listen to us gun owners now while he’s running for governor, how can we expect he’ll act on our behalf in office? If gun owners do the hard work of getting Stand-Your-Ground through our General Assembly, would DeWine sign it? Will he sign them into law as any pro-gun Governor would, or will he Kasich us in the back and veto them? We don’t know, because DeWine REFUSES to tell us. It’s no surprise, DeWine has long cared more about what his anti-gun pals like the Brady Campaign (who has endorsed him in the past!) and Bloomberg’s brigade want than the wishes of law abiding Ohioans who need firearms for self-defense. As Attorney General, his easy, calculated maneuvers to appear pro-gun don’t even come close to making up for his war on our gun rights. But now DeWine is running for Governor in the May 8th Republican Primary – desperately hoping that gun owners forget about those attacks on our gun rights! Don’t let him get away with that, please help hold him accountable right now by helping us air this video ad all across our state! You see, DeWine and his cadre of consultants have made a calculated bet that he can get sweep his record under the rug and roll out a few endorsements in hopes that gun owners will forget what he did. I’m sure you’ll agree it’s time that gun owners send a message to Mike DeWine and all of his anti-gun allies in our General Assembly: you mess with our gun rights and you will be held accountable! You can lock in an ad right now for $25. YOU can hit back against DeWine for just $25, reaching thousands of gun owners at one time! For $50, you can personally get the word out to tens of thousands of pro-gun Ohioans. Or, if you want, you can wreak havoc on DeWine’s plan to lie and confuse gun owners across Ohio by sponsoring this add to 40,000 pro-gun Ohioans for $350! If I can raise the resources, we’re already prepared to roll a statewide radio buy and get this up on radio, as well! Imagine the satisfaction you’ll feel between now and May 8th seeing these ads rolling all across Ohio! These ads send a simple message: you may have declared war on gun rights in the past, but you’ll absolutely be held responsible for that. What happened in DC won’t stay in DC – everyone across Ohio will know what DeWine did and that DeWine refuses to apologize and go on record in favor of your gun rights. Please stand with us now, when we need you the most, and help us get up on the air across Ohio right away! P.S. You’ve been waiting years for this moment. For decades, Mike DeWine declared war on our Second Amendment in the US Senate. Now, DeWine refuses to apologize for it and refuses to go on record where he stands when it comes to the issues gun owners face in the next four years. Help us hold him accountable, when he’s desperately trying to convince gun owners and everyone else across Ohio that he’s pro-gun, by helping us run this video ad statewide until the May 8th Republican Primary! We have the ad ready to go, but we need your help funding this ad campaign! You can fund 1 buy for $25 that will reach 2,000 gun owners or 4 buys for $100 that will reach 9,000 gun owners. But if you really want to send a message, you can wreak havoc on DeWine’s plan to lie and confuse gun owners across Ohio by sponsoring fourteen ads statewide to over 40,000 gun owners for $350! Help us expose DeWine — at whatever level you want to — TODAY! 2018 Pre-Primary Gun Rights Voter Guide!